US Map for use in web pages. Users can easily click on a state and be hyperlinked to an individual state page. Creating an image map is a time-consuming task. 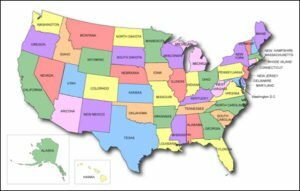 You could spend hours developing an image map of the entire U.S for your website. But why re-invent the wheel…we’ve done the work for you! Whether you use it for a web directory, information source, report, development project, research or whatever, this map is a great time saver! This USA map is configured with “hot spots” to click through for each state. Download this United States HTML Clickable Map Immediately After Purchase!